St. John's citizens gather at Harbourside Park before the march. St. John's citizens made themselves heard on the first Casseroles Night in Canada on May 30, and are invited to meet up at Harbourside Park for round two on Wednesday June 6th around 8 PM. Bring your pots and pans, and something to hit them with! If anyone has any suggestions as to how to make this event bigger and better, please share in comments. Leave your house at 8pm and clang your way down to Harbourside Park. Hopefully the noise will attract others to join in! When we get to the park, keep making noise and see how big of a crowd we can gather! 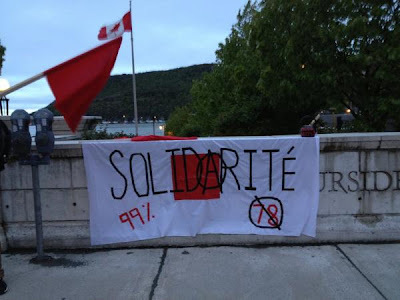 The news source Rabble.ca has called for weekly Casseroling to continue showing solidarity with the student movement in Quebec and disapproval for Quebec's Law 78, which restricts Canadian's civil liberties, but to also make our discontent over Bill C-38 heard loud and clear. Let those in power know that Canadians are paying attention! Members of Occupy NL have also created a postcard (front and back downloadable from that link) that you can send to your MP about the ominous, undemocratic Omnibus bill C-38.